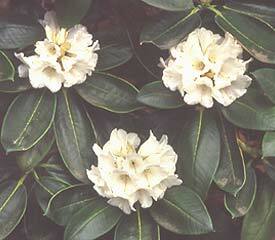 Flower/Truss Description: Funnel-campanulate, white, sometimes pink, spotted purple. Ball-shaped truss holds 10-20 flowers. Foliage Description: Leaves narrowly obovate to elliptic, up to 4½" long, upper surface shiny, lower surface with reddish-brown indumentum.